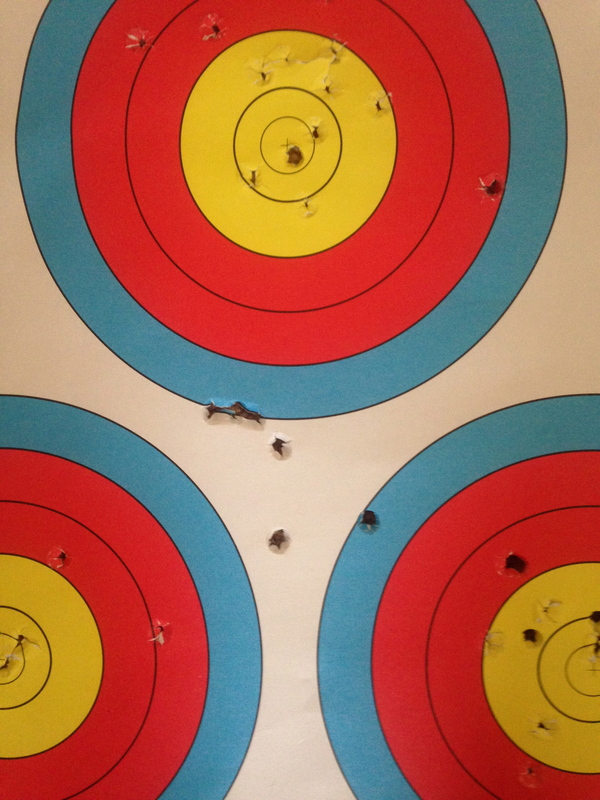 It is not the bow, at least on an indoor range. It isn’t the arrow; it isn’t the sight, the stabilizer, the string, the quiver or the size of the target. Regardless of what I shoot or where I shoot, the results are pretty much the same, when I shoot indoors. 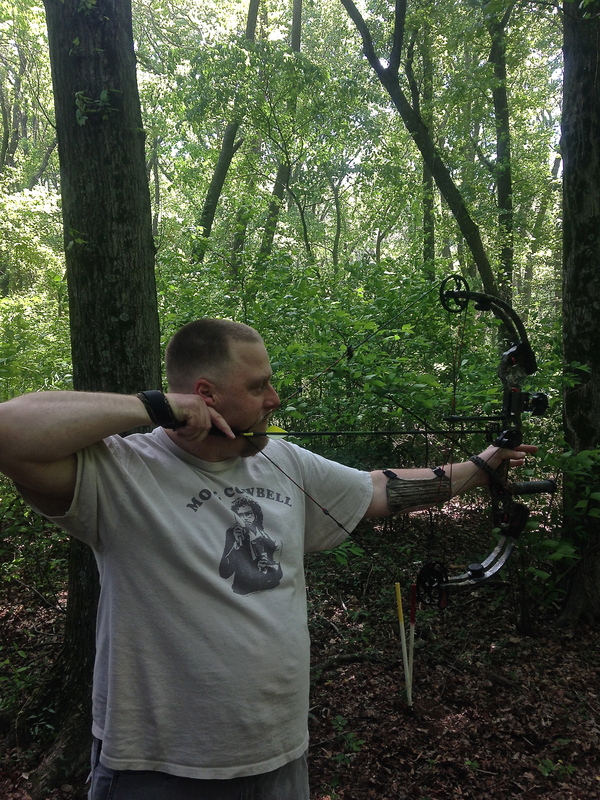 Using two bows I collected the results for 26 sessions of 30 arrows targeting a FITA 5 spot. I used a modified scoring system, if I hit the white that was 10 points, if I hit the blue that equaled nine point (30 arrows versus 60 arrows per session). 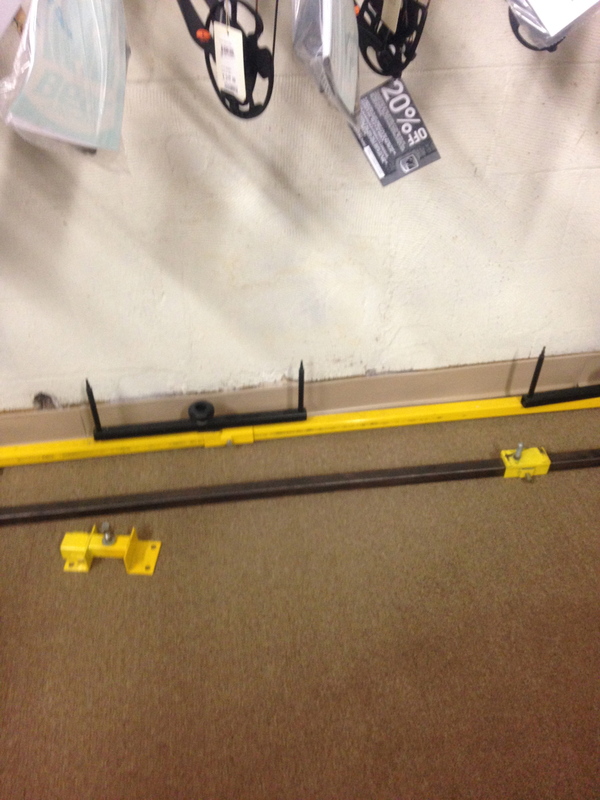 The distance to the target was measured using a tape measure on two indoor ranges, 20 yards. Each range was used equally. All 26 sessions used Beman Hunter 500 carbon arrows with 100-grain tips. 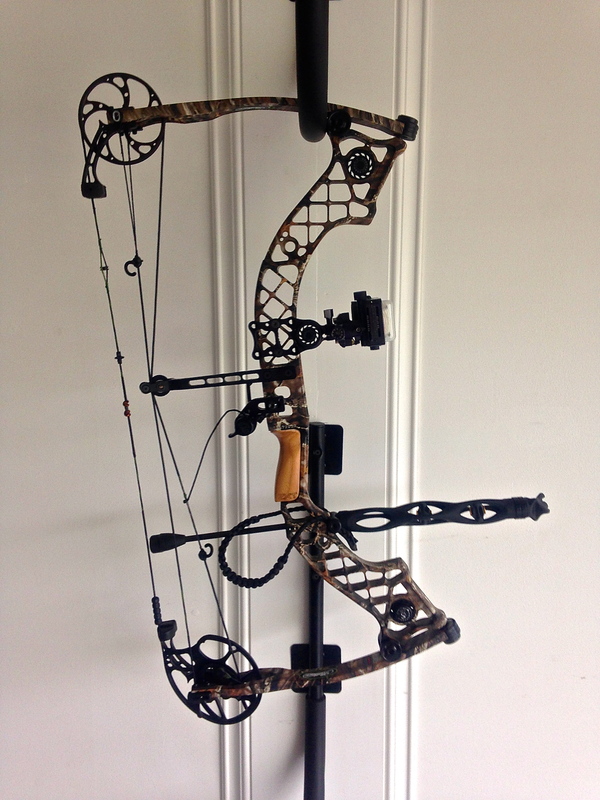 One bow was the Mathews Conquest Apex 7 with Bee Stinger stabilizers, an Axcel Achieve sight with a 6-inch bar and Axcel X-31 scope with 4X magnification. 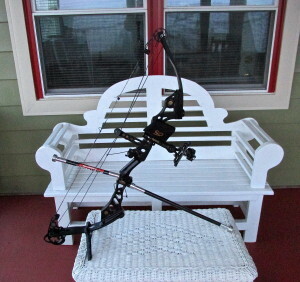 The other bow was a Mathews ZXT with an Axcel Armortech 7-pin hunting sight and Trophy Ridge 8 inch static stabilizer. Both bows were matched for draw length and weight. A single release was used, the Scott Longhorn Pro Advantage. The data was collected over a four-week period. 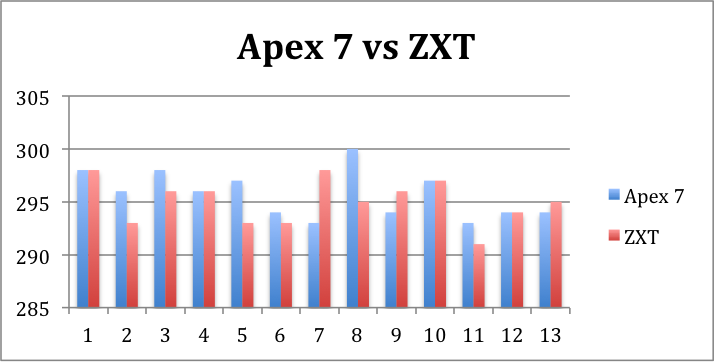 The median score using the Apex 7 was 296, (range 293 – 300) while the median for the ZXT was 295 (range 291-298) and the interaction of scores was statistically non-significant (p<0.37). 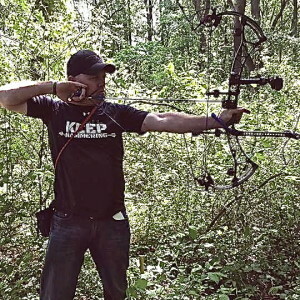 Anecdotally, shooting a Bear Authority and BowTech Insanity CPX yielded scores of 294 and 293, respectively (these bows used only once and scores not included in the analysis). 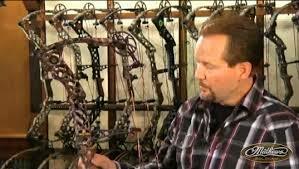 This analysis was conducted to first determine if there was a measureable difference between the two bows, there is not on an indoor range at 20 yards. Second, the data establishes a baseline from which to work toward shooting improvement. For example, a variance in scores, that is a value outside the range (essentially a lower score) suggests something about the shooter has changed. A value consistently above median means improvement. In either case, it is important to understand why the values have shifted. So, when your numbers are like this, that is good. 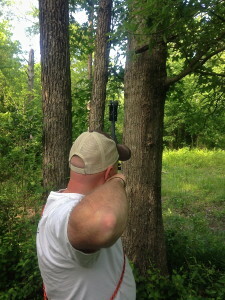 Recently, trying a modification of my grip dropped scores to the 292 level (post study). 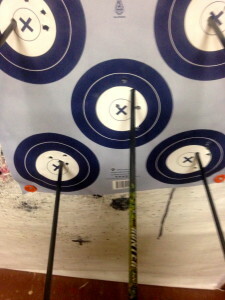 While practicing and attempting to adjust my grip another archer, pointed out a simple method to make the correction. After several attempts, using his recommendation (thanks, Norman) the scores returned to their median levels. 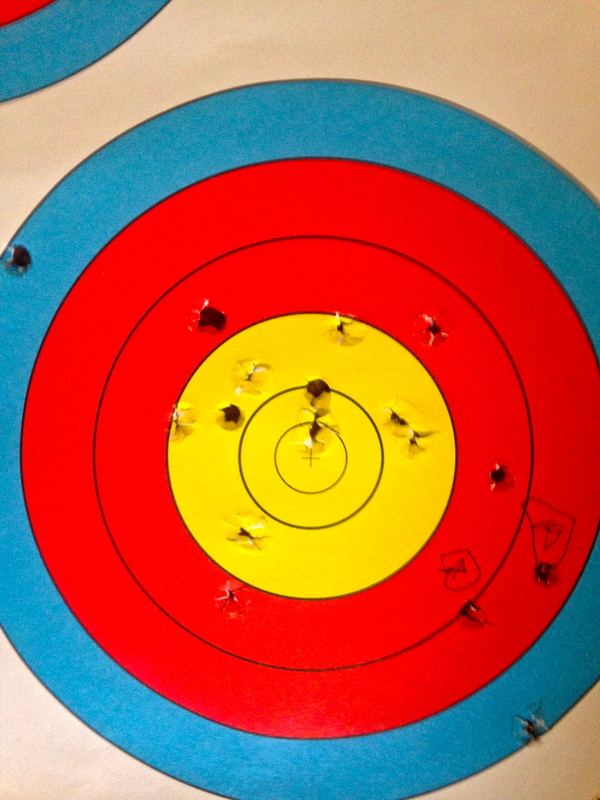 While adjusting my anchor point, a slight change, my scores were slightly above the median. Understanding baseline levels and using a little math can aid in refining form. It can also help, by tracking scores, to identify training loads and assign recovery days. Although I keep track of 3D scores, the differences in ranges, target size, distances, weather, and other uncontrolled variables require a lot more data to provide a meaningful analysis. Overall, indoor shooting is more controlled having fewer offsetting conditions to interact with the data used to establish baseline values thus allowing for a good measure to use as a reference. What this study provided was evidence that both bows used preform essentially the same indoors at 20 yards. 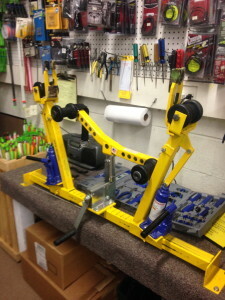 The failure to reach a perfect score is therefore not the equipment’s fault. (Not to suggest that equipment doesn’t fail, it does happen on rare occasion) The data further sets a baseline to be used as a control to judge progress and monitor form variance. 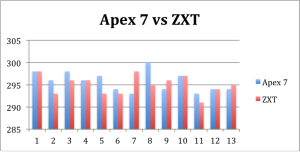 However, a point is a point, so during tournaments, I’ll shoot the Apex 7, even if one point is not statistically significant. Author David LainPosted on May 30, 2014 May 30, 2014 Categories UncategorizedLeave a comment on Numbers can be fun. The other day, I practiced in the attic at Shore Sportsman in Easton, MD. As I was leaving, Kenny, their archery manager, mentioned they have 2 used Apple Archery Bow Presses and 1 used Apple String Jig for sale. He asked if I knew of anyone that might be interested in buying them. Off-hand, I didn’t know of anyone, however, I offered to share this on Facebook and my website. 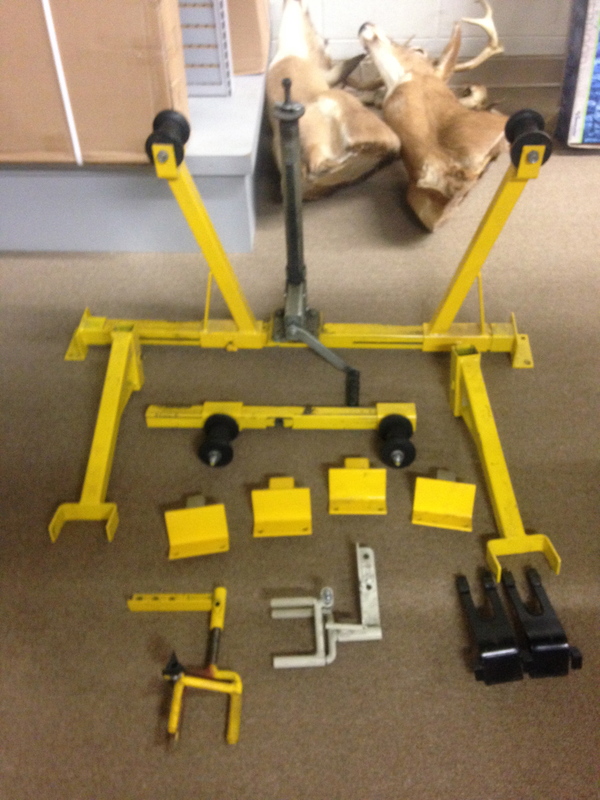 If you are interested call Shore Sportsman at 866-291-0084 or 410-820-5599. 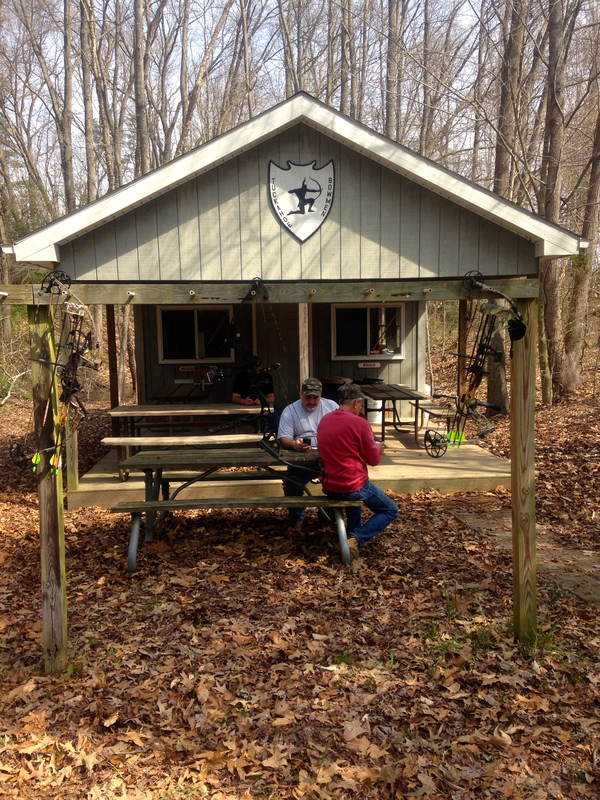 Soggy Bottom Archery Range is ever changing. The targets are demanding and well placed in natural realistic positions. There are inducements to shooting at Soggy Bottom beyond the advanced skills gained by archers testing themselves against a challenging array of artificial beasts. This week, the motivation for many was the Winner’s Trophy. 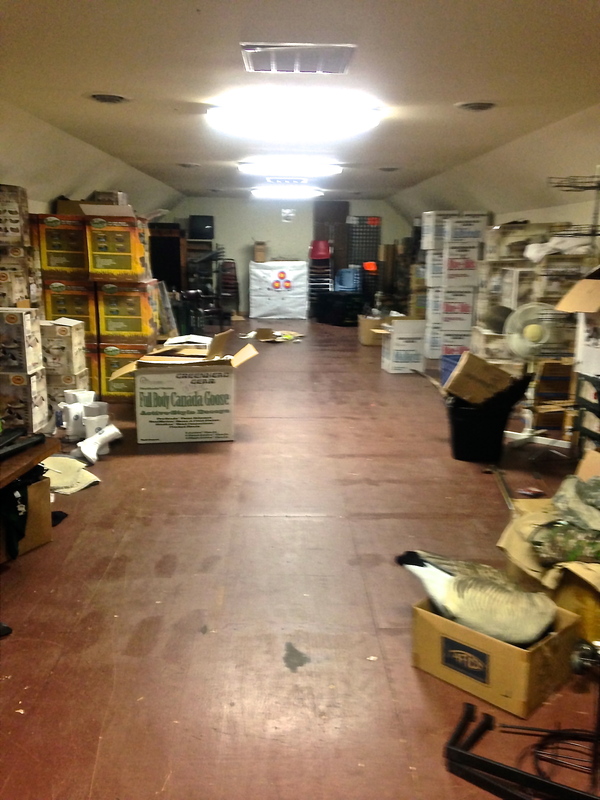 Each archer that practices at Soggy Bottom must survive pests and pestilence. Those with the fortitude to return for the weekly competition are among the best and heartiest shooters in the region if not the country. 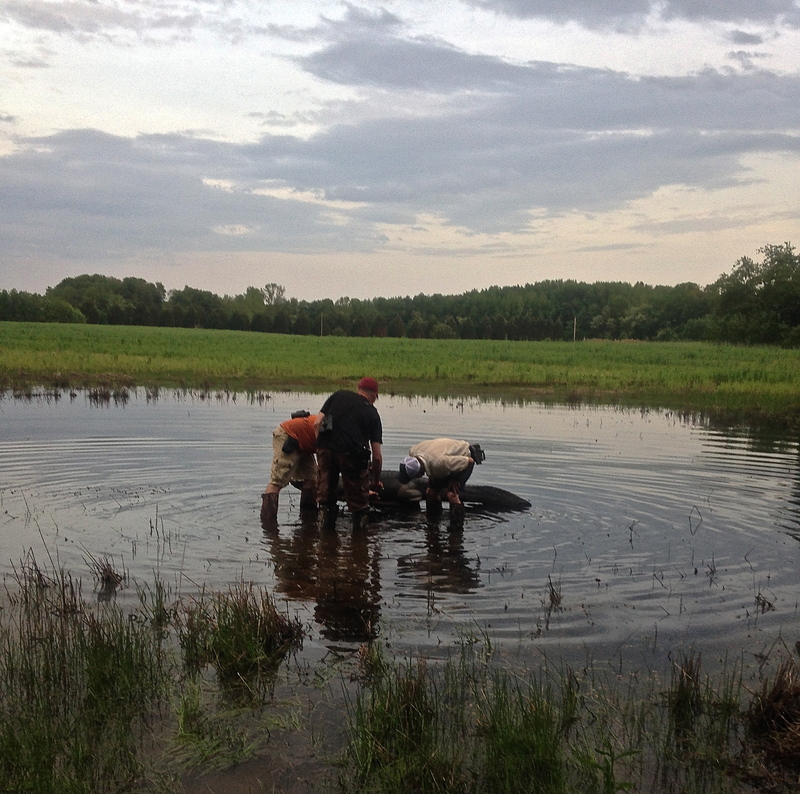 This week unseasonably cool temperatures and rain had dampened the aggressive tick and insect attacks, but the mud and mire made up for their slack. Prepared for the terrain, with conquest and glory in mind, a determined troop of bowmen were steadfast in their Tuesday evening assault on foam. Norman Gustafson, proprietor of the range, is a student of wildlife. His study has provided him with the knowledge to amass the faux animals on his twenty-target range in exact positions where one might discover them during a hunt. This evening, Norman laid out one of the most incomprehensible arrangements of targets one could image. Each archer knew there was more on the line than practice. A Winner’s Trophy was spoil for the victor. The prize was constructed from the highest quality Far East Oriental cardboard and had been assembled by hand in America. 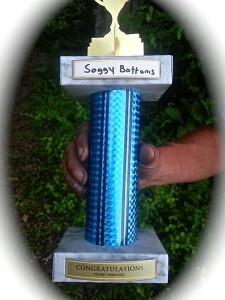 Customized for the Soggy Bottom range the trophy was inspiration for all to shoot their best in pursuit of the fame. 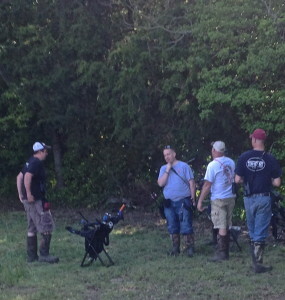 Despite fierce competition, in the woods the groups shooting in nearby proximity exchanged philosophical debate. Individuals were identified and compared to areas of the gastrointestinal tract that ends and exists the body. Considering the importance of the anatomical location and its function one could only regard the comparison as complementary. Others were praised for their religious affiliation with groups related to the Pennsylvania Dutch, even though no one had arrived by horse and buggy. The archers proffered their knowledge of science and religion while displaying for review their skill shooting 3D. Final tally for the day gave victory to John Sapp. Mr. Sapp accepted the trophy secured during the most difficult of competitions. Receipt of the cellulose award and the champion’s ceremony were sadly not covered by ESPN; this report being a small consolidation of the triumph. 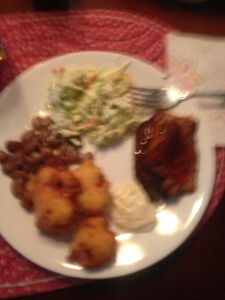 Spoils to the Victor! John Sapp’s acceptance speech. 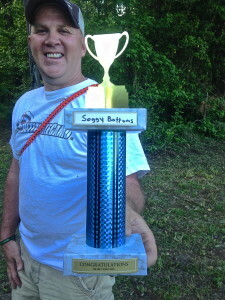 Soggy Bottom never disappoints. Each week new adventures await the elite that accept Norman’s challenge. Their diligent returns speak volumes to their immune systems, eyesight, and nearly Olympic gymnasts balancing skills. This past week, the prizewinner needed to put his best on the line to assure victory. 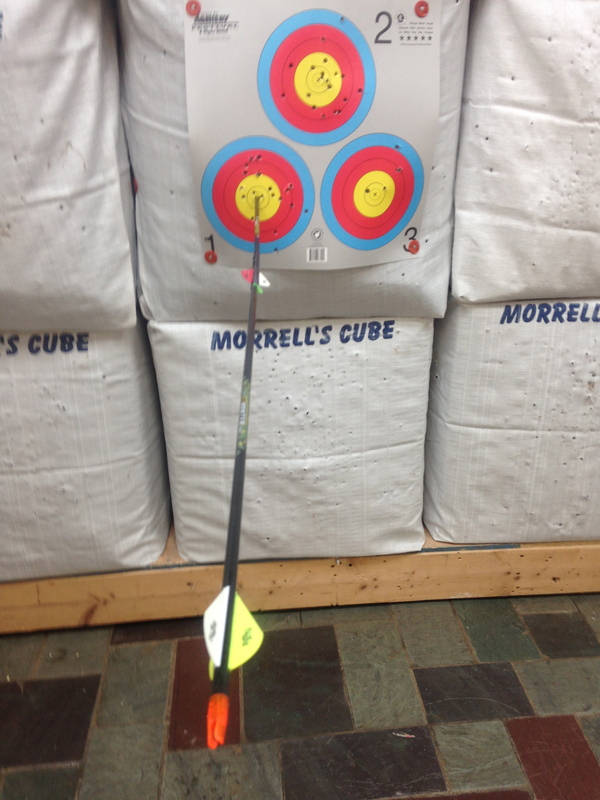 Why is it when I buy new arrows within a few shots I have busted arrows? It started with Easton Fatboys. I bought six from Wildcat Archery in Pooler, GA. 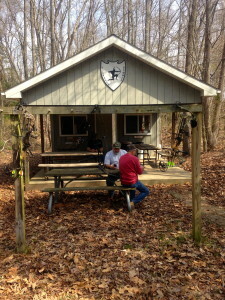 There is an outdoor range near their shop where I drove to test the Fatboys. On my second shot, one of my new $26.00 arrows smacked a flat head nail, hidden behind the target, driving the tip into the shaft. Crap! After purchasing a dozen Beman ICS Hunter arrows from Cypress Creek Archery in Millington, MD, I practiced on their indoor range. In a hurry, I shot two arrows per target on a FITA 3 spot to reduce time spent walking back and forth to collect the arrows. Within a few shots, I hit a totally random ‘Robin Hood.’ Twenty dollars right down the drain. A few days ago, shooting 3D with brand new Bemans a friend smacked one of his shots into my arrow. Initially, I though only the nock had been damaged. Closer inspection revealed the carbon was cracked. Another ten bucks gone faster than losing it in Vegas; set me up again. 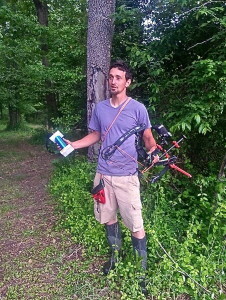 In North Carolina, I took a few new arrows out to practice. I found a weak point in the target, the arrow passed though and hit a support brick ruining the arrow. Ten dollars gone. 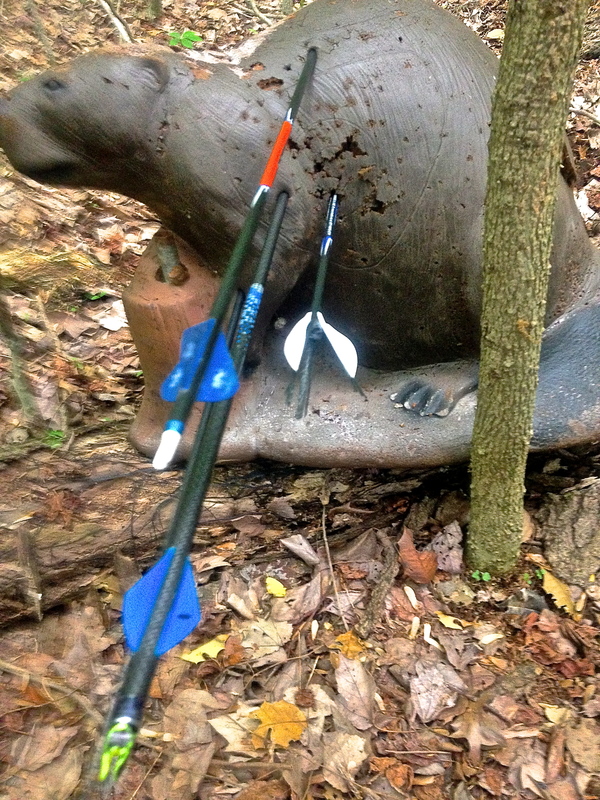 Oddly, arrow accidents seem to decrease after 2 – 4 of the newly purchased ones are destroyed. I tried buying six, rather than a dozen, to see if I could break the cycle. It didn’t take long before only four remained. 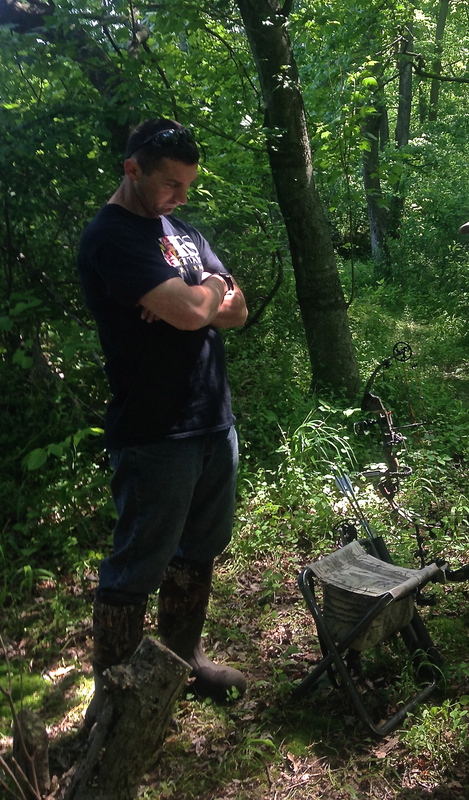 However, the old beaters, veteran survivors of the new arrow phenomenon, remain unmolested by man, obstacle or nature. Considering the lesser arrows, I wondered, what if I bought eight nice arrows (say $10.00 each). Then, from Wal-Mart bought four inexpensive arrows ($4.00 each). 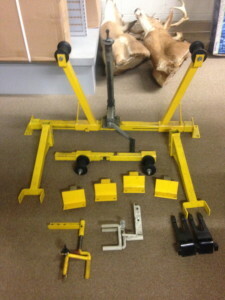 This would produce a mixed dozen arrows, cost $96.00. Next, by hand, break the Wal-Mart arrows thus arresting cycle. The manually sacrificed arrows would cost $16.00. Allowing events to occur naturally, starting with a dozen $10.00 arrows, statistically I’d end up with four broken $10.00 arrows – cost $40.00. If the mixed dozen, 8 nice arrows and 4 less nice arrows (which I’d break by hand), worked to remedy the new arrow curse, it would leave me ahead by $24.00 and I’d still have 8 decent arrows. This is an untested hypothesis. Another two bite the dust. My really special, by definition expensive, arrows are used with prejudice. Only one per target, extra caution is taken to search for that hidden nail, and most certainly vigilant care to ensure no wild shots that might strike wood, brick or metal. Essentially, the expensive shafts are for indoor shooting. Outside, especially 3D shoots where well-placed arrows become the target, I’ll use the less expensive bin shafts until I have an arrow sponsor. All 3 arrows survived, none were new. But, seriously, is this just me? This past weekend on the Eastern Shore of Maryland there were plenty of organized activities for people who enjoy playing outside. Among them were running events, cycling events, a triathlon, and 3D shooting. I wanted to do them all but that wasn’t possible. 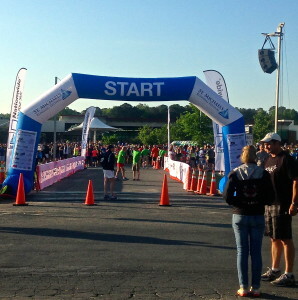 In advance, I’d signed up for the St. Michaels Running Festival held on May 17th. 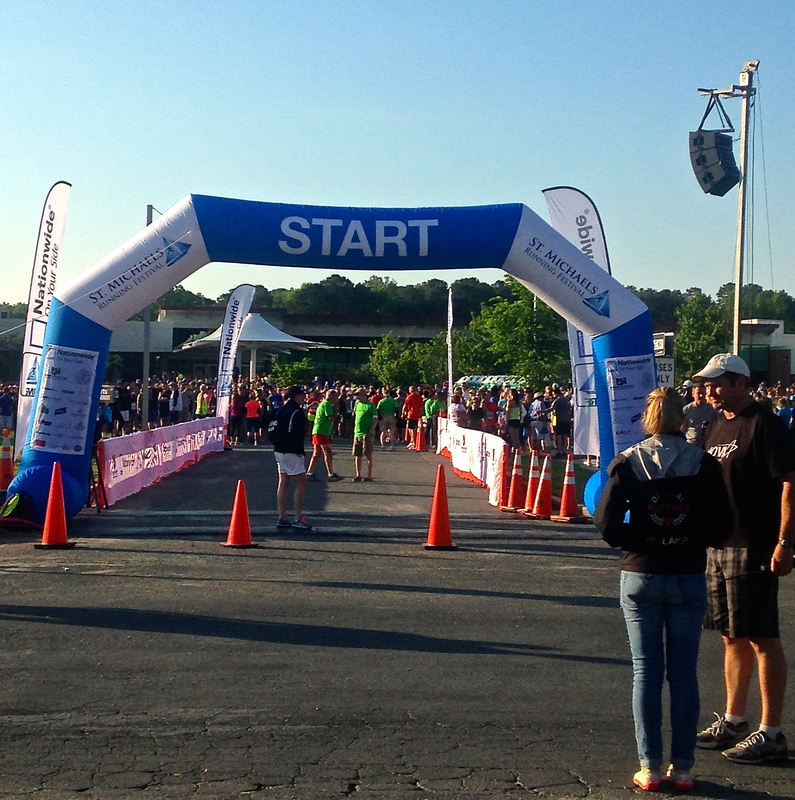 Within days of registering the Maritime Triathlon was announced and would be held May 18th. Racing back to back is tough. I decided to stick with my Saturday running event then shoot 3D with the Tuckahoe Bowmen on Sunday. Two days before the 3D shoot I changed my planned ½ marathon to 10K. I’d done a weekend similar to this in the past. That is, I’d run a ½ marathon one day and shot 3D the next. Shooting 3D the day after a ½ marathon wasn’t horrible on my legs, but neither was it wonderful. 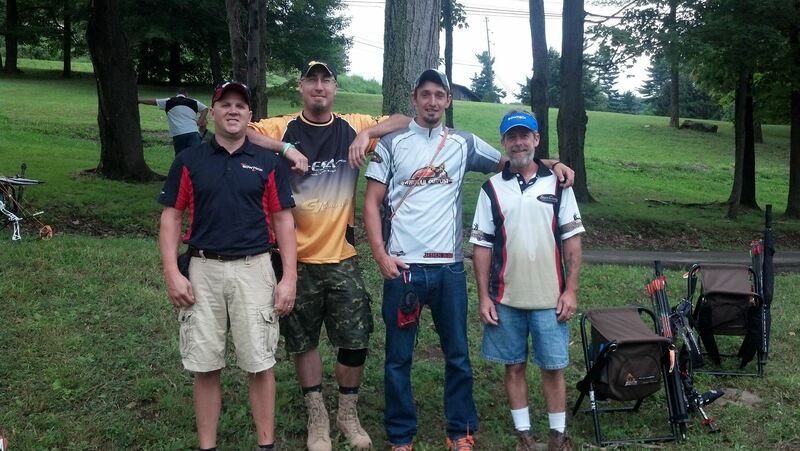 Shooting with the members of the Tuckahoe Bowmen means competing with some serious archers. On Sunday, folks showed up wearing their pro-team shirts or T-shirts commemorating their participation in world archery championships. Fitting with Saturday night’s post-run celebration, my T-shirt commemorated the “Hair-of-the-dog”, a local spirits shop. The Tuckahoe Bowmen had a decent turn out of archers despite another competitive tournament in the region. The groups shooting included children, traditional and compound archers. I joined a band of four: Paul, Norman, Mevko, and Bill. It had been raining earlier in the week so knee-high boots were the foot apparel of choice among our troop. 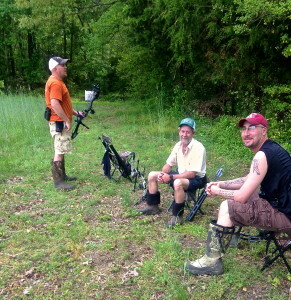 The rain brought cool temperatures, 50 to 70 degree-days, which seemed to have knocked back the ticks. Sunday was sunny and cool. 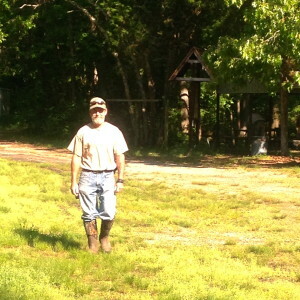 Paul had been out early to set up and supervise the placement of targets. Suffering a back injury, to reduce the potential of further lumbar strain, he and other volunteers put out an abundance of smaller targets. As such, raccoon, turkey, bobcat, and javelina where the foam de jour. Paul and Norman, typically, battled for 1st and 2nd place. Paul took the day by a narrow margin. 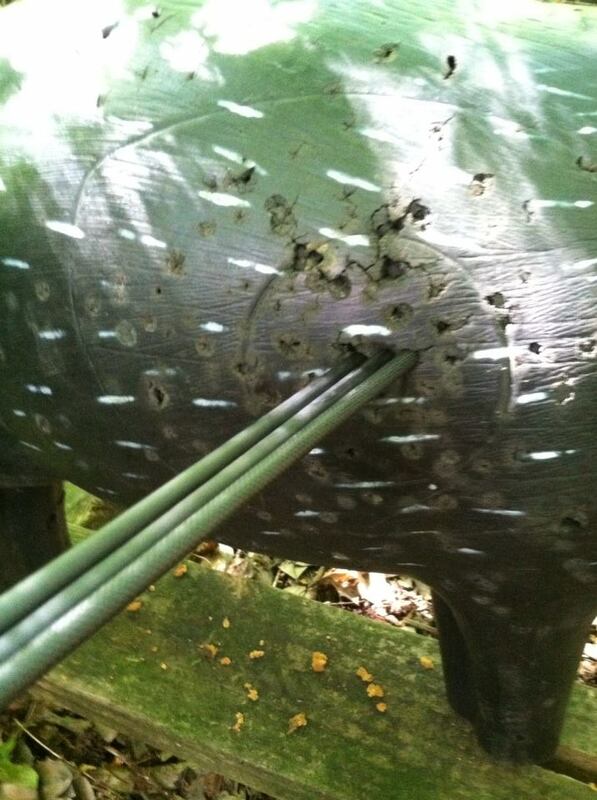 It would have been nice to have departed the range with all of my arrows intact. Bill dashed that by shooting into one of my brand new Bemans. I ended up scoring a personal best for the Tuckahoe Bowmen 3D course. Saturday’s run was not a great as I’d thought. My Garmin time and the official time had significant differences. In that regard, nothing serious enough over which to lose sleep. The Saturday night libations seemed to of had minimal effect on my shooting. It remains unclear what that indicates in the matter of my current skill as an archer. All in all, a very nice weekend on the Eastern Shore. “When you come up the lane look for the 2nd telephone pole on your left, in the field. You’ll see an orange flagging tied to a tree on your left. Turn left there, go across the field, past the pond and follow that road all the way to the woods.” My instructions seemed a little clandestine for 3D practice at Soggy Bottom. I never found the 2nd telephone pole or the orange flagging tied to a tree. 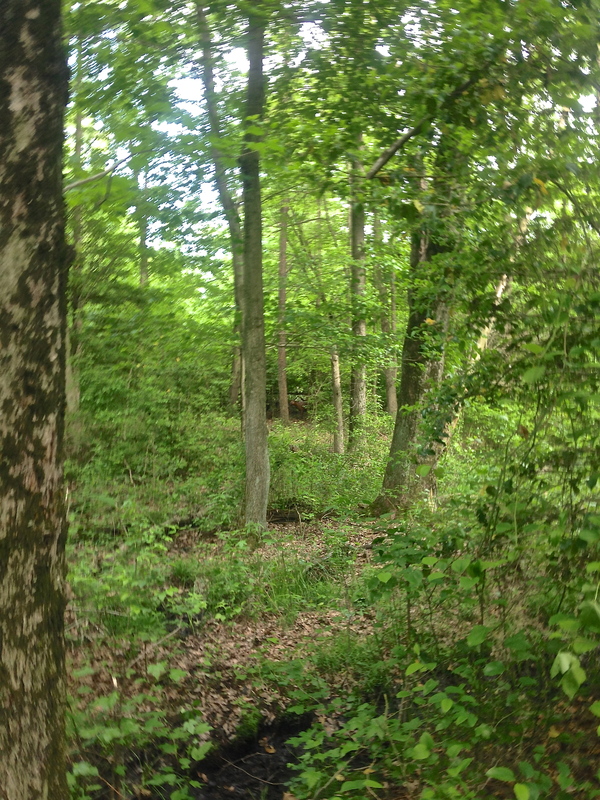 I ended crossing the wrong field and drove into to wrong patch of woods. Using my mobile phone, I call for help. Help arrived; it was Norman riding across fields on an ATV. The private, 20-target 3D range, appropriately named Soggy Bottom, may be one of the hardest courses on earth. The owner, Norman Gustafson, takes pride in maintaining a course that will stretch your limits and cost you arrows. Being invited to shoot with the archers that practice at Norman’s complicated range is privilege. Or, it may be that inviting an uninitiated to this obstinate range, watching a neophyte’s eyeballs pop at seemingly impossible shots, is amusing to the old pros. On this day I felt like the sacrificial lamb. The group shooting today was: Norman, John, Paul, Lee and me. Beyond their skill in archery, these fellows live at the forefront of fashion. You can see in photo below, from the brothers of “Duck Dynasty” to the models covering “GQ”, these Soggy Bottom boys lead the way in outdoor style. We warmed up on a bag target at 20 – 40 yards before moving onto the range. As we approached the first target I was puzzled. There was no target in sight. The stake was obvious, but I did not see a target. 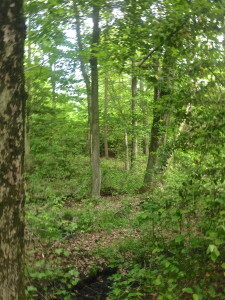 Remaining quiet, I looked into trees, looked for a lane, and scanned the perimeter. There was no target. 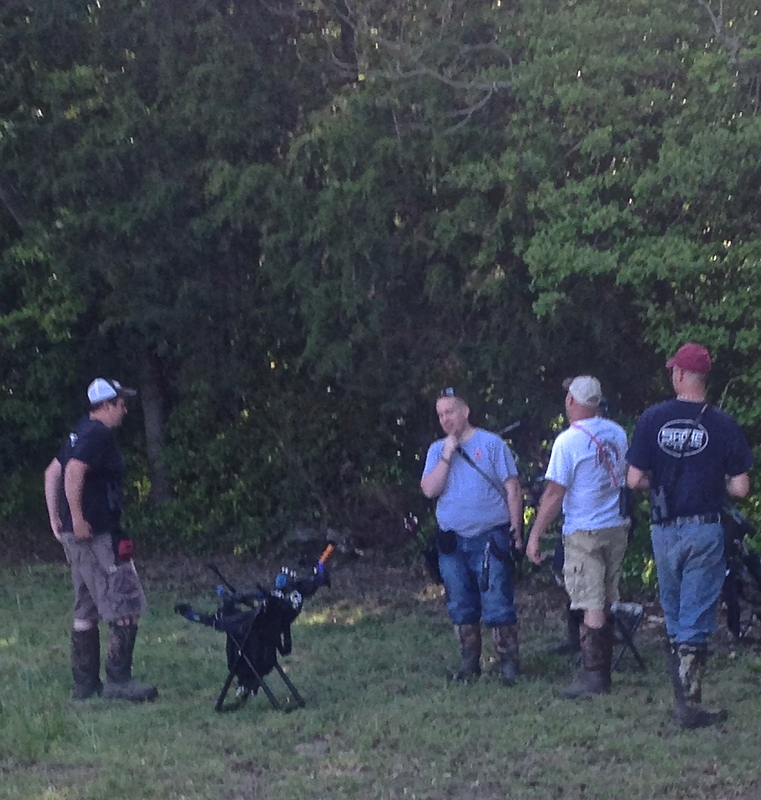 I thought to myself, how well do I know these guys and is that a banjo sitting on the ATV? Paul recognized my confusion and pointed to the target. 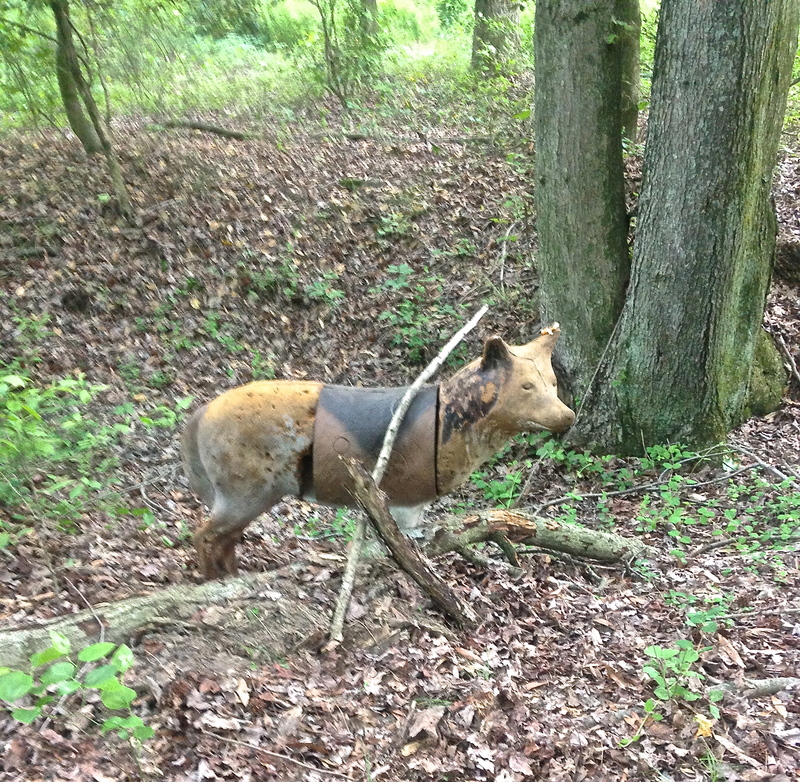 The animal was not at the end of a cleared lane, about 25 years away, with underbrush and trees between it and us. Accustom to shooting on ranges (limited experience even at that) where a lane can be seen and distances estimated I immediately knew I was in for a challenge. Moving through this mosquito infested, tick filled swamp we rotated our shooting order as we approached targets. One small critter, a beaver, was positioned on a log next to a tree about 30 yards from the stake. When Lee’s turn came to shoot, he aimed and released an arrow. Instantly, we heard a sound other than an arrow striking foam. Unsure of what Lee had hit we approached the beaver to find he’d split Paul’s X’ed arrow. As the target count increased so did the difficulty. 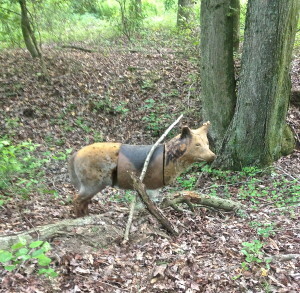 For example, there was a wolf in a field, the stake in an open area, the window to shoot within passed through dense forest, across a creek, and slightly uphill some 33 or so yards distant. 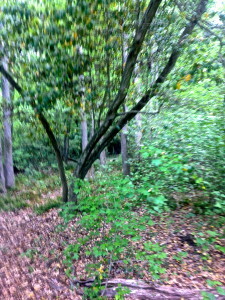 Across the same creek, similar distance, Norman had a hen turkey on a small hill, surrounded by vegetation. The hen was positioned so that the profile was angled leaving the X on a tangent to the stake. Any shot variance and goodbye arrow. Norman looked but never did find my Beman. 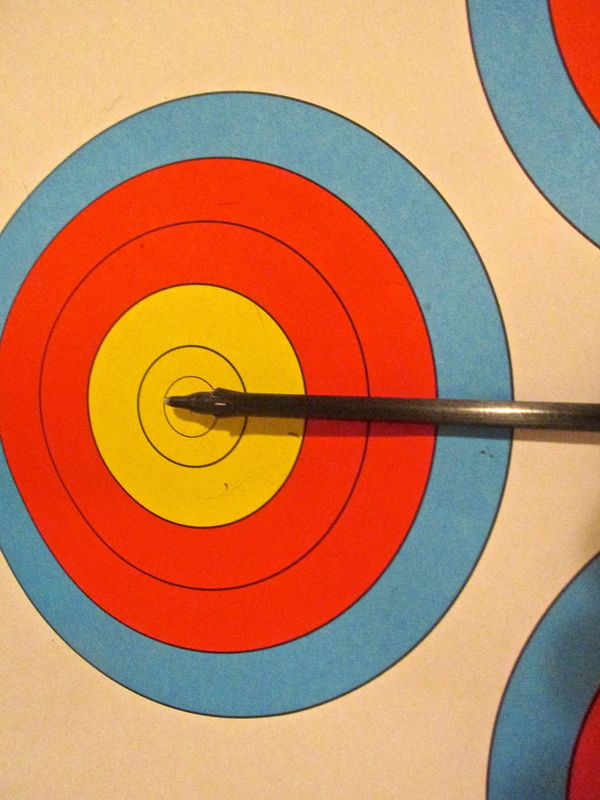 Luck of the draw placed me first on what was promised to be the most difficult target, number 20. 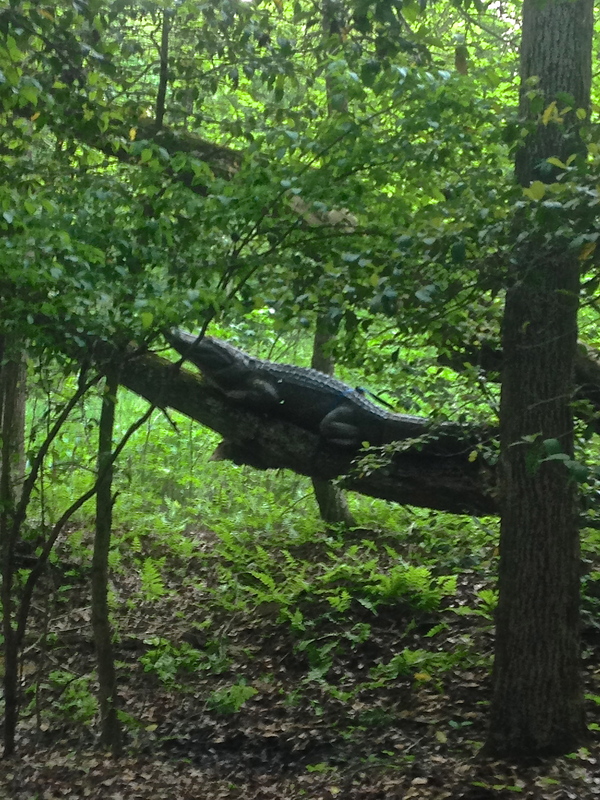 In a pond, sat an alligator at 31 yards (I know that now). The sun had nearly sat and the gator was not much more than a silhouette. I struck wood and touched foam, they gave me a gentlemen’s 5. John won the day by one point. 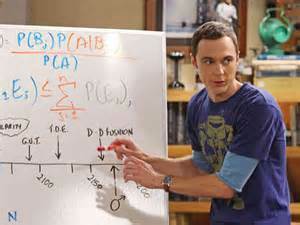 The counting of X’s in Norm’s favor. I finished losing only one arrow and collecting a large sample of Maryland ticks. Apparently, ticks at Soggy Bottom enjoy Duranon Tick Repellent. Doubtless, practice at Soggy Bottom will help prepare anyone for future 3D tournaments, so long as malaria, Lyme’s Disease, water moccasins, and poison ivy don’t kill them. Excepting me, the others in the group seemed unmolested by such pests. Even though I was covered with anaphylactic dermatitis the next day, I look forward to my next adventure at Norman’s Soggy Bottom range of humiliation. 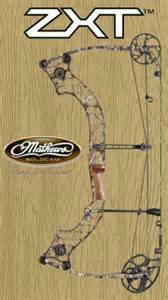 Interview with Corrine Bundy of Mathews Inc.
Mathews, Inc., makes both of my bows. 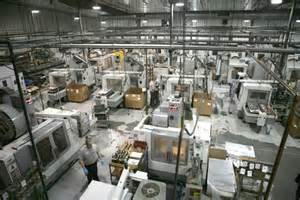 Where equipment is critical I like to know about the manufacturer, the people at the company, and have a feeling for that organization. 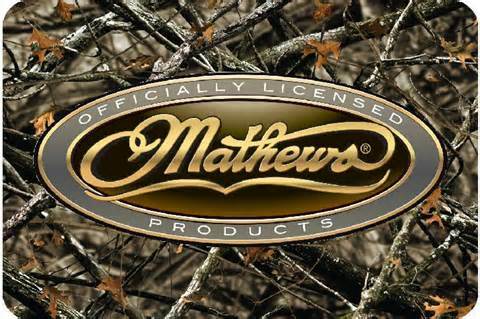 There is a lot written about Mathews on their website and floating around the internet. In my opinion, the best information about a company comes from its employees. I took a long shot to see if I could get an interview with anyone at Mathews. Corrine Bundy, Marketing Communications Specialist, replied that Mathews would be happy to provide me an interview. What I heard impressed me. Corrine Bundy, Marketing Communications,Mathews, Inc.
Corrine and I spoke by telephone. She is not only a businesswoman. Corrine is a 3 time National Archery Champion and was a member of the Texas A&M Varsity Archery Team. Aside from her athletic ability she has her Bachelor’s from Texas A&M and her MBA from Viterbo University. When we first began our conversation, she had that MBA professional tone. I’ve learned to recognize that pleasant yet impersonal voice from decades of business practice. Within minutes, however, when she started talking about Mathews and archery, her tone changed to one of excitement and passion. When I sense that ‘lightness’ someone’s voice I know I am hearing honesty. Of the topics we discussed one she was proud of is the company’s involvement with NASP®. The National Archery in the Schools Program (NASP®) was developed to serve specific educational and conservation purposes. Educators were looking for ways to improve student motivation, attention, behavior, attendance, and focus. While Wildlife Conservation agencies were concerned too many young people were forgoing learning outdoor skills that would inspire them to spend more time with wild things in wild places. NASP® was created by the Kentucky Departments of Fish & Wildlife Resources, Department of Education and Mathews Archery in the late summer and fall of 2001. 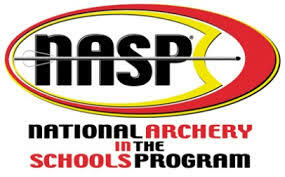 Archery equipment used in NASP® is highly standardized to be safe, durable, economical, and most importantly, provide universal fit for almost every student. 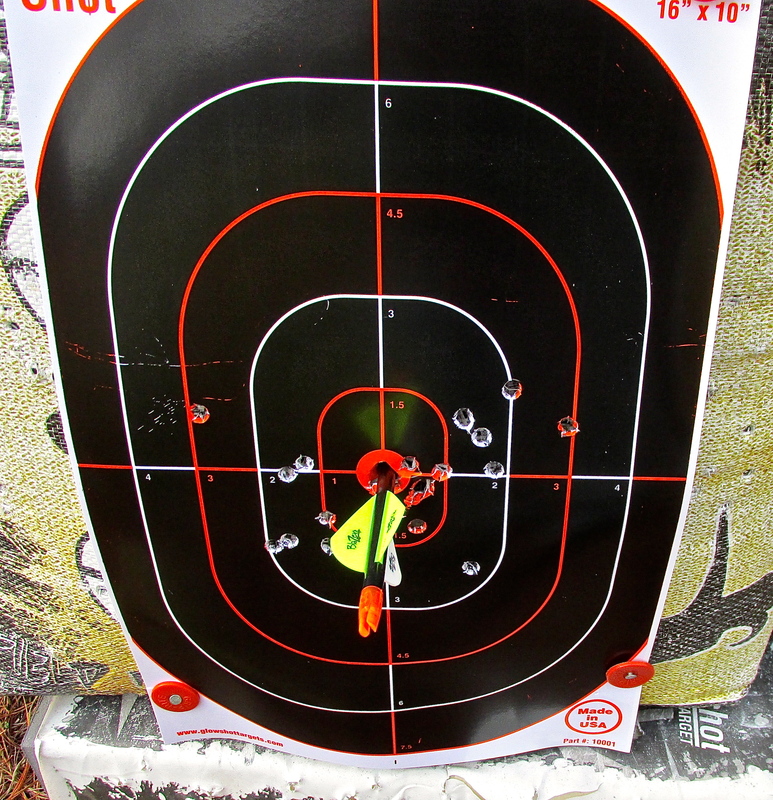 In NASP® learning the process of shooting is stressed far more than arrow scores. The only bow used in NASP® is the Mathews Genesis® which has no let-off and is adjustable from 10-20 pounds in draw weight at any draw length. 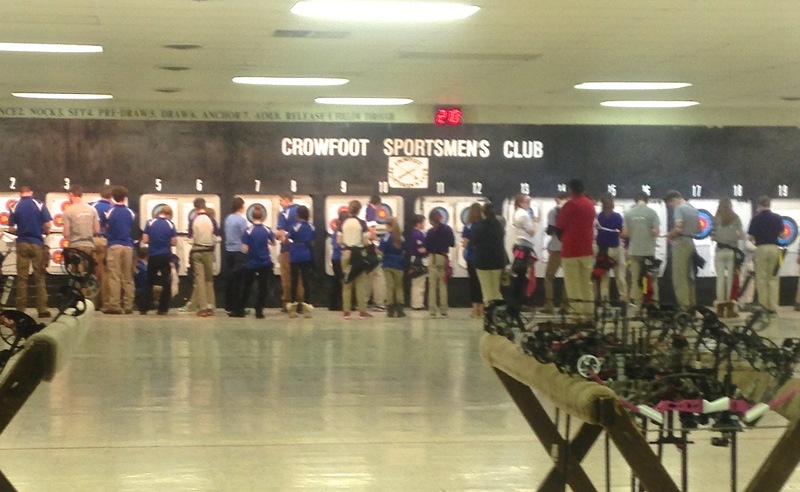 To date, NASP® has introduced more than 11 million children into the sport of archery. “That is more children than nationally participate in little league baseball,” noted Corrine. As the children grew, and grew out of their Genesis bow capacity, Mathew recognized these future archers were buying mid-range priced bows from competitors. To fill the gap between their Genesis products and their Mathews bows, they created the Mission line of bows. The Mission bows provide the adjustability needed to match the growth of youngsters, while maintaining an affordable price tag. Actually, my first compound bow was a Mission Riot. When I purchased my Mathews Apex 7 I immediately, without trying, had someone ask to buy my Mission Riot. It was sold on the spot. From my experience, I honestly can’t find fault with my since sold Mission product. 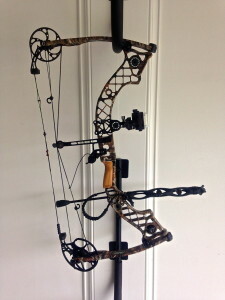 To replace the Mission Riot, I bought a Mathews ZXT. 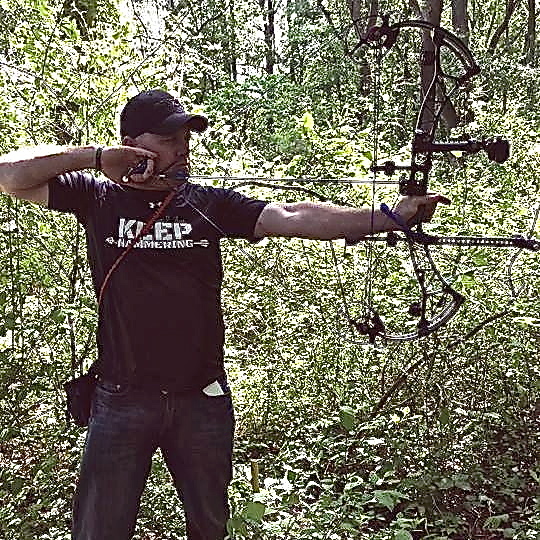 Having two Mathews bows is a problem – I can never decide which to shoot in a 3D tournament. 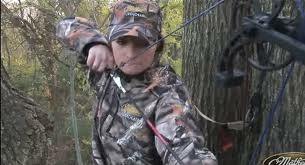 Corrine pointed out that Mathews bows and accessories are not found in “box” stores. 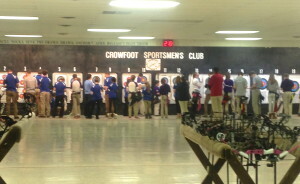 They focus on the community pro-archery shop. The large ProStaff is positioned to support those shops and their community. “Community is number one with Mathews,” she pointed out. Asking her about the working atmosphere at Mathews, I wondered about the daily feel of the company. For example, is there an oppressive atmosphere or one that is open and relaxed. I wasn’t this blunt in my query but she got the message. Corrine pointed out that when the company relocated to its current facility, a significant move, to Sparta, WI, 76% (30 of 39) chose to move with the company. That is extraordinary and speaks for itself. 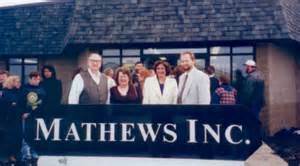 Today, Mathews has nearly 400 employees. During our call I also discovered a bit about Matt McPherson, their CEO. He is an inventor. It is somewhat unusual to find a person with the creativity to invent who can also be the CEO of a large business. When I asked if McPherson was an engineer, Corrine answered that he was their chief engineer. “Before he started designing and making bows, he worked in his family’s body shop. This experience is evident in the attention to detail found on every Mathews, Mission and Genesis bow. He cares about functionality and innovation, just as much as the look and small details.” Just the kind of genius I’d like to meet in person. There’s a lot you can read about Mathews at their website, mathewsinc.com. I am not going to repeat much other than to point out the tournament results, which are posted on their site. 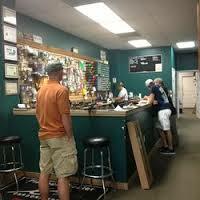 So far, in 2014, Mathews shooters are placing on the podium approximately 2 to 1 over other bow manufacturers products. In 2013, that ratio was slightly greater than 2 to 1. To clarify, that ratio is twice as many wins compared all other bow manufacturers combined! My Mathews Apex 7, photographed on our porch in NC. I enjoyed interviewing Corrine, hearing of her childhood days counting worms at Dutch’s Trading Post (then her family owned business) and finding her role at Mathews. Learning, first hand, about the people that make the bows I shoot was special. Near the end of the call, she said, “We build quality bows that maximize the shooter’s potential and ideally, takes away excuses.” Darn, I thought, I sometimes need an excuse – it will have to be my release. Author David LainPosted on May 13, 2014 May 16, 2014 Categories UncategorizedLeave a comment on Interview with Corrine Bundy of Mathews Inc. The other day, in the mail, I received a medal for an archery competition. River, my dog, likes to wear medals and have her picture taken. Why she seems to enjoy this I do not know. 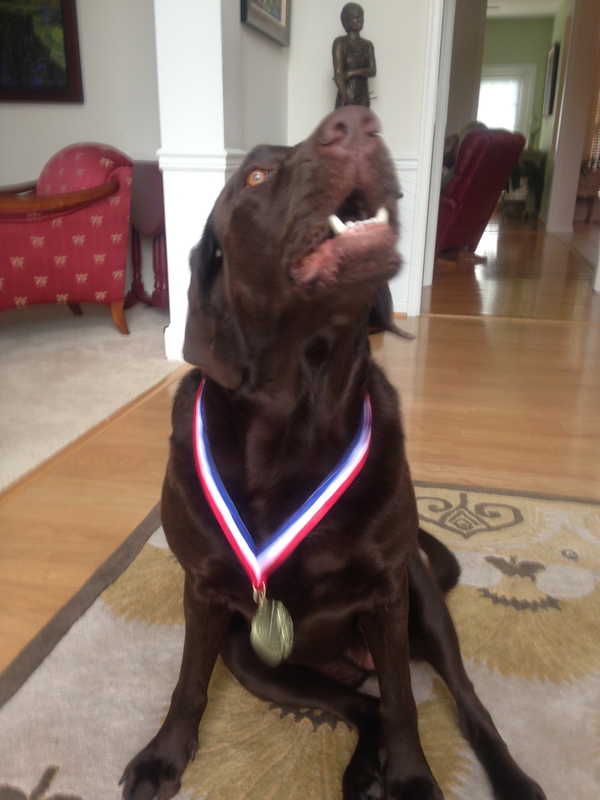 After her photo-op, the medal was placed in a drawer where I store similar sports awards. The drawer contains only medals collected from 2006 – 2014. A little more than a quarter are medals for podium finishes. Most of the medals in the drawer are finisher’s medals, memoirs of the event. Some are more meaningful because they took more effort to complete or made a lasting impression. All competitive experiences are memorable to some degree but a few stand out. Among the standouts is the Mt. Evans Ascent, a running race that begins at 10,600 feet and finishes 14.5 miles later at the summit, an altitude of 14,264 feet. It claims to be America’s Highest Road Race. That race really hurt. Actually, at mile 9, I thought I was having a heart attack, and was looking forward to it. Other memorable races include the Tokyo Marathon for the massive crowds and awful weather – it was cold and rained the entire 26.2 miles. Across the globe the Bristol 10K in England stands out because of the bazaar warm-up. Prior to the 10K in England, someone announced to “warm-up”. The Brits queued then squared with military precision in order to start synchronous calisthenics. I’d had never seen anything like it nor have I since seen anything similar. Once, racing in Italy, I was in a break away (cycling) and feared that if I got dropped I would get lost. I didn’t get dropped, placed 2nd, then got lost going back to my hotel. Ironman Hawaii left two lasting memories. First, my wife, Brenda, sitting on top of a dumpster screaming and cheering as I cycled through Kona. Her acrobatics were later shown on NBC Sports. And there was running with Jeff Conine the former major league baseball player. Not so much because he was on a World Series winning team but because while we were running he was being interviewed during the marathon segment of the race. A reporter, and her camera crew, riding in a Ford Mustang convertible (Ford is the race sponsor) with the top down were talking with Conine while filming. We weren’t running fast and were 6 miles from the finish. I was dying and cramping but refused to stop while the camera was rolling. As soon as the Mustang and its posse drove away I walked. I never saw Jeff Conine again. 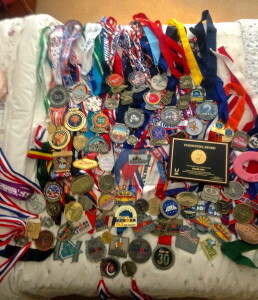 The people I’ve met while collecting these medals have enriched the experience. I worked with Bryan Clay, Olympic Gold medalist (Decathlon), and trained with Dr. Bruce Buchanan. 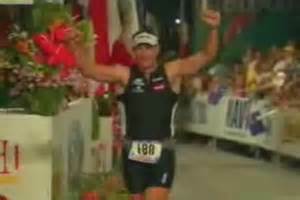 Bruce is listed as one of the Top 10 Ironman Kona age-group finishers having won it 6 times and set a course time record (50-54 year age group) which remains unbroken. There are many others, especially the coaches, to mention here and still do them justice. Jeremy Synder (the tall guy), Bryan Clay and me (center) at a meeting in New Orleans. What is prevalent in elite athletes is their drive; that desire to put themselves on the line to win. That characteristic can be applied whether it is done through work, in activities of daily living, or in competition. It is trait found among the athletes I have met in archery. The recent archery medal is now in the medal drawer. Aside from the photo in this article I expect it will rarely be seen, again. It is the next medal and the new experiences which I look forward to. 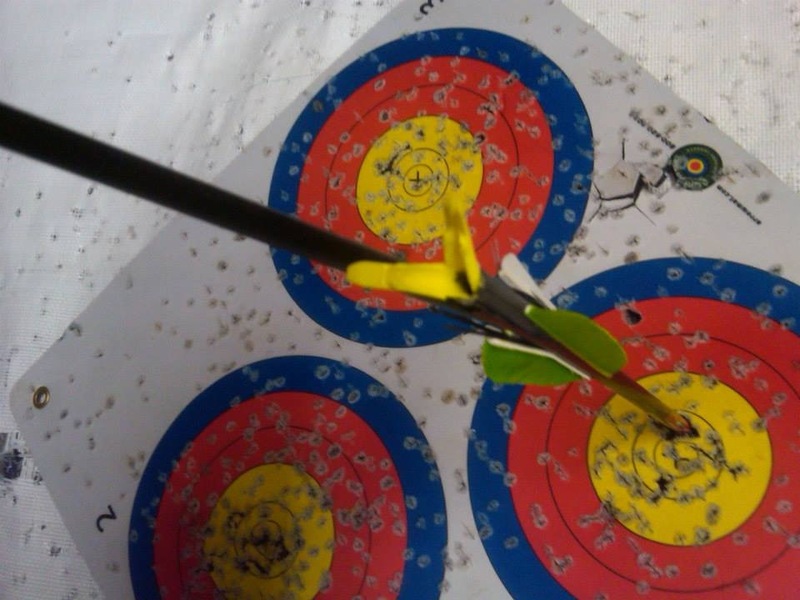 To sustain and increase proficiency in archery nearly daily practice is required. An off day or two in a training cycle is good for recovery. The other day my grandson, Sean, was visiting. While practicing he joined me to advise, question and critique. Sean is serious about archery. Sean accompanied me during my 18-meter practice. He is four and an expert on many topics, including archery. I assumed that he would become bored with me and my limited shooting skills, then move on to more important matters. The practice did not proceed as I’d predicted. The target was a FITA 3-spot, and my bow for this session was an Apex 7. Sean stood behind me to my left and observed as I shot 6 arrows, two per spot. For those six shots he was unusually quiet. I mistook his silence for boredom. After shooting the six arrows, we walked forward to retrieve them. Once I’d pulled the arrows Sean decided he’d be the official ‘arrow holder’ from that moment forward. His arrow management included driving them into the ground, through the gravel driveway. It took a little convincing that he was not treating the arrows properly. For the second end*, as I prepared to release an arrow, Sean yelled, “GO!, SHOOT! NOW! GO!” Sean, I said, “I have to concentrate, you need to be quiet.” His response was an escalating whisper, “Now, shoot, go, Go..GO!” and so forth until each arrow was freed. There was no abating his vociferous enthusiastic attempts to coordinate the release of each arrow with his command. Each end was shot, retrieved, and arrows tendered to the official holder. Again, arrows were shot, collected and the process started anew. His next command, “Granddaddy, shoot it in the middle” . I hit the top middle. “What do you mean, Nah?” I asked. “You missed,” he explained. In debate, we approached the target and examined the center shot. Using his finger he touched the ‘center’ of the paper target. The ‘center’ being the white portion of the paper which is surrounded by the three targets. We regrouped and shot for the ‘center’ of the paper. Sean then demanded I hit a red ring and then a blue ring. I complied as best as I could. Not being satisfied, he borrowed a pen, approached the targets and drew, in fine point, two tiny points for me to hit surrounded by a slightly larger scribble in two red rings. “Shoot here, Granddaddy,” he instructed. I shot for his scribbled lines, hitting off center. Upon review Sean exclaimed “Nope.” He insisted upon dead center hits; the little taskmaster was relentless. Collecting the ‘Nope’ arrows we set up to try again. With each shot, absolute dead center remained elusive. 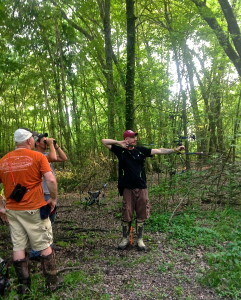 Sean, the arrow holder, patiently handed me the arrows while patiently waiting for success. “Well, I named mine, mine is named ‘Sticker’, you should name your bow” Sean said. “I’ll think about that, Sean.” I said. “I have blue suction cups on my arrows” Sean added. “I can suction that,” he said, pointing to his inked center marks as I continued to miss them. Of course, he was referring to Sticker’s arrows with the blue suction cups. Sean never grew bored with shooting. He also never stopped talking about archery, Sticker, my misses, neither did he stop ordering me to “GO, SHOOT, NOW” when he supposed my aim was on target. All in all, it was a good practice. Having a four year old to reinforce a practice session does add another level toward maintaining focus. When it was over, Sean, was disappointed I didn’t shoot one into the woods. * end: For those of you that aren’t archers an End is – A round of arrows shot during an archery event (rarely more than six arrows). 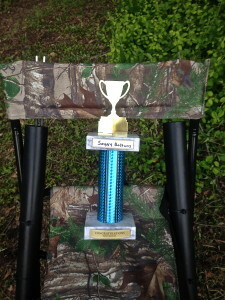 Although, shooting with Sean was not a tournament, I’ve used the term ‘end’ to describe 6 shots. Everyday in Georgia was not an archery day. Everyday was not a day to go hunting. One day was set aside strictly to fish. The fishing would be a sleep-deprived event. When most people have a birthday, going fishing is not their first choice for a celebration. However, Brenda, my wife is not most people. 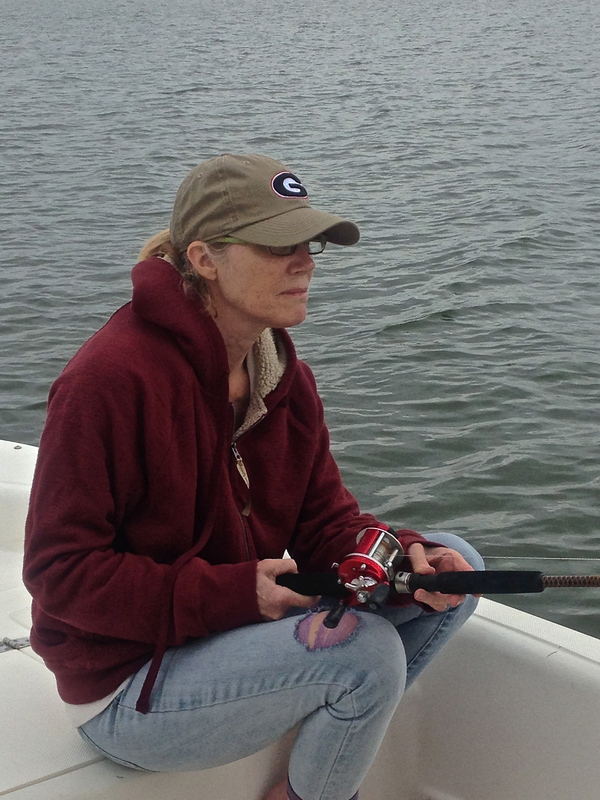 For her, a fishing trip was one of her birthday requests. As such, her father, Ray, and I chartered a boat and guide to find striper. 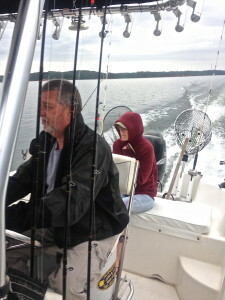 Brenda loves catching striper or any fish for that matter. 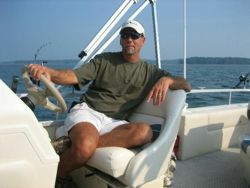 Even though Ray has a Carolina Skiff, a Triton Bass Boat, and G3 Pontoon (not forgetting his jet ski) and we fish from all these boats, it is nice to hire a guide service that provides the boat, gear, and bait, and let them handle the prep and cleanup – especially when it is a birthday present. The plan was to meet Joe, our guide, Thursday at 6 AM. Brenda said that was too early and opted for 8 AM. For her, catching the fish is part of the pleasure; she gets nearly the same enjoyment from simply being on the water. The bonus, we’d get to sleep late, and we were certain we’d catch plenty. Ray, 86, didn’t complain but I felt confident he’d have been first up for the earlier time. The monkey wrench for the extra sleep was a less accommodating surprise. The Wednesday before the fishing trip we were expecting the delivery of Polaris Magnum ATV. The ATV arrived in the evening, around 8PM. It had been hauled to us on a Ford F-350 that also towed a large trailer. All was well until the driver, Clinton, backed away, turned to drive off and ran his right front wheel into a ditch. His leaning, sedentary truck ended up perpendicular to the road blocking both directions. Nobody at our house had any idea of the man’s predicament. We were busy inspecting the new toy. We learned of Clinton’s wedged wheel when I took River, my Labrador retriever, out for a run. Under River’s watchful eyes, Clinton and I disconnected the trailer and tried using the wench on a Bad Boy Buggy to provide extra pull to free the Ford. That was a no go. At 9 PM, I called AAA. They said no problem; help would be here in 45 minutes. An hour later, AAA called to say help was on its way and would be here in 45 minutes. After another 45 minutes past, now nearly mid-night, AAA called to report they couldn’t get help until Thursday – our fishing trip day, our passage blocked by a truck. The wasted time and false hope waiting on AAA had made matters worse. It was now very late and help would be harder to find and potentially more costly. Clinton, using his GPS found a non-AAA tow company, Davis Classic and Collision, in Washington, GA. Ben Davis said he’d never leave anyone in such a jam and would be right out. True to his word, Ben arrived and freed Clinton from the self-imposed roadblock. Being worthless to provide any additional physical help, Brenda and I offered encouragement from the house. We got to sleep around 1:30 AM. The alarm, for our extra sleep went off at 5:30 AM. 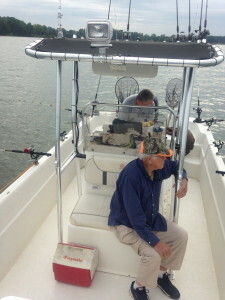 By 8:00 AM we were on the water and after catching several fish, I was asleep on the bow. At 2:00 PM, all of us feeling the shortage of sleep, we decided to call it a day. Despite the sleep deprivation the fishing was a blast; Brenda really enjoyed it. Once ashore, our fish were cleaned and we headed home to eat them and watch Braves Baseball. I fell asleep in the 3rd inning with a belly full of fried fish, hush puppies, cole slaw, speckled butter beans and sweet tea.